Preparing a place for open fire cooking should be away from overhead power lines, tree limbs and dining canopies, basically anything overhead and within 20 feet of your campfire placement. You should only set up a fire pit in a place where it will be permanent. 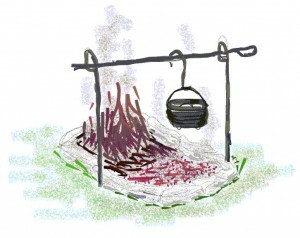 There are three types of layouts we like for open fire cooking. 1. An oval shape ring of medium sized rocks with a cowboy cookset at one end for hanging your ovens and a fire at the other end making more coals to cook with. This is the ideal setup for your cowboy cookset and Dutch oven cooking if you have a place in your yard. By hanging your ovens on hooks of different lengths is how you control the cooking heat. The longer the hook the higher the temperature and the shorter the hook the cooler, it’s like turning the heat up and down. Your friends will be surprised. 2. In the ways of the old west would be to dig a rectangular hole 18 inches wide, 12 to 16 inches deep and as long as needed to fit your cook set. What I like about this type of pit is laying five or six steel rods (rebar) across the pit spaced evenly apart to support your skillets or other cookware that cannot be hung from the cowboy cookset. After the fire has gone out the hole can be filled back in just like the cowboy cook would do on the cattle drive. 3. A keyhole fire pit looks similar to its name. It is a large flat rock standing vertical in the back. (See sketch) Then lay out medium sized rocks in a line on both sides of the flat rock to resemble a keyhole. Make it as wide as needed for a cooking grate. Build a medium fire in the area in front of the flat rock and as you make coals push them up against the rocks to hold in more heat. Push more coals up against the flat rock tapering down towards to front. The back of the campfire will be your high heat area and front being your low heat area giving better heat control. The cooking grate can be used for quick grilling, holding a fry pan and making coffee. A campfire for keeping warm and a campfire for Dutch oven cooking are two different things. To keep warm you want that roaring fire that continues to burn with medium high flames. For open fire cooking you want to start with a roaring fire and continue to feed the fire for a while. The purpose is to feed the fire with as much wood to make the amount of coals you will need to cook over. The fire will die back as the wood burns leaving you with hot coals. These hot coals are what you want to cook over, not over fire itself. It is best to keep a fire going to the side, continually making more coals for all your campfire cooking needs. As soon as we can setup our cowboy cookset in the new space, we will replace the campfire cooking sketches with real pictures. (The sketches are compliments of my grandchildren) Now that I have moved into my new home, I hope to have real pictures. I still think the ones my grandchildren have done are pretty good.